online product for your business administration. "Even very complex and long processes such as customer follow up, purchases, sales can be executed in quickly." "Everybody can login, checkout the current process state and push it forward." "Execute your processes with ease and without worrying, Orderflow is graphically keeping track of each step in the process." "Almost no typing, drag and drop to create and new orders"
"The process updates your inventory, stock, budget, security- and safety regulations and traceability"
"Do not lose time with long implementation efforts and expensive trainings." "Each screen is simple and 100% adjustable to fit your needs." "Save money using Orderflow by avoiding expensive and risky software development projects, high startup fees." 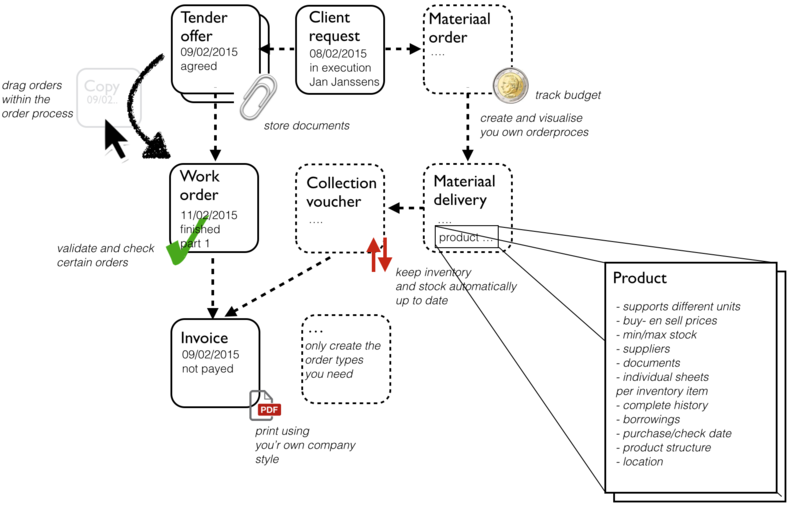 The above screenshot shows a simplified example of an order process. Every client can adapt and fill in the above canvas to meet their needs and their business processes.